Naturalized in Belgium (GRIN), California (Jepson). Naturalised in the coastal districts of south-western Western Australia. It has spread from its initial site of naturalisation at Albany to Mount Barker and Denmark. There are also populations at Walpole-Peaceful Bay and Mount Manypeaks, and an isolated population has also been recorded on a train track at Yarloop. Also naturalised in a few locations in the UK and the USA (Weeds of Australia Biosecurity Queensland Edition). Introduced and naturalized in a few localities in Britain (PFAF). Naturalized in Belgium (zones 6a-8b) (GRIN), California (Jepson). Naturalised in the coastal districts of south-western Western Australia (Zones 9a-12b). It has spread from its initial site of naturalisation at Albany to Mount Barker and Denmark. There are also populations at Walpole-Peaceful Bay and Mount Manypeaks, and an isolated population has also been recorded on a train track at Yarloop. Also naturalised in a few locations in the UK and the USA (Weeds of Australia Biosecurity Queensland Edition). Introduced and naturalized in a few localities in Britain (Zones 7a-8b) (PFAF). Substantial overlap with California climate zones (Cal-IPC). In North America, collected in ballast on east coast in late 1800s but then not again until 2014, in California, where it is reportedly scheduled for eradication; in Australia, on list of 28 most threatening non-native plants, even though considered only to be in early stages of establishment there. In southwestern Western Australia: said to be spreading rapidly by seed along roadsides and walking trails in areas of medium to high rainfall (Jepson). False yellowhead (Dittrichia viscosa) is regarded as an environmental weed in Western Australia and as a potential environmental weed in some other states. 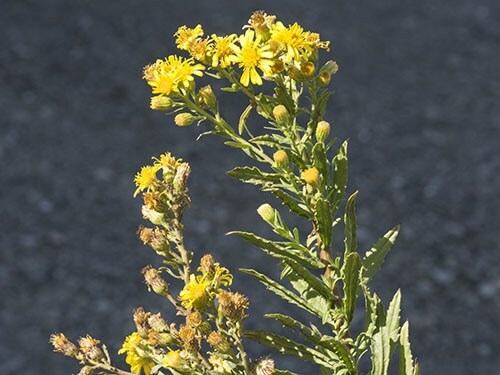 This species is on the Alert List for Environmental Weeds, a list of 28 introduced plants that are currently not very widespread but are considered to pose a significant threat to Australia's environment. False yellowhead (Dittrichia viscosa) is thought to have the potential to be a serious environmental weed, particularly in southwestern Western Australia and areas of similar climate in southern and eastern Australia. In south-western Western Australia it has already invaded the Mt Adelaide and Mt Clarence Reserve in Albany, where it has spread from roadsides and walking trails into relatively undisturbed bushland (Weeds of Australia Biosecurity Queensland Edition). Environmental weed in western Australia (Weeds of Australia Biosecurity Queensland Edition), overlapping with California's climate zones (Cal-IPC). D. graveolens is a moderate weed in California (California Invasive Plant Council) and is on the California noxious weed list. It occurs in 41 counties (Calflora) and is rapidly expanding its range in California and elsewhere and is considered invasive in California (Brownsey 2013). Brownsey, R., Kyser G., & DiTomaso J. (2013). Stinkwort is rapidly expanding its range in California. California Agriculture. 67, 110–115. Native to Europe (including the Mediterranean region), western Asia, and Africa (GRIN). Present primarily in Europe and the Mediterranean regions (GBIF). Native to the Mediterranean Basin (Jepson). Hardy in zones 9a-11(Dave's Garden). Substantial overlap with California's climate zones (Cal-IPC). ‘.. known to release substances that inhibit the germination of nearby plants’. Allelopathic properties seriously affecting some plants. . Alellopathic effects inhibit other plants from germinating but do not kill off existing vegetation. Minor displacement of some dominant species (Victorian Invasive Plants). An exhaustive Google/Google Scholar search did not reveal any additional evidence of this and the question defaults to a “no” answer at this time. Has a ‘high fresh biomass production’. Likely that the biomass would increase, but assumed to have no effect on fire regimes (Victorian Invasive Plants). An exhaustive Google/Google Scholar search did not reveal any additional evidence to support and the question defaults to a “no” answer at this time. Known to be toxic to stock. Favoured by heavy grazing as not eaten by animals/ insects. ‘It can also cause contact dermatitis in people’. ‘ stems and leaves are covered with glandular hairs which exude a sticky foul-smelling oil [which] can cause allergic reactions’. Toxic properties at most times of the year. Not a weed of cropping or pastures (Victorian Invasive Plants). False yellowhead (Dittrichia viscosa) can cause health problems in humans and animals. The sticky oil produced by the leaves and stems causes contact dermatitis, resulting in itching and blistering of the skin. It is also known to release substances that inhibit the germination of nearby plants and is toxic to livestock. Dense infestations may also reduce the productivity of pastures and the aesthetic appeal of tourist areas (Weeds of Australia Biosecurity Queensland Edition). Spiny bracts may cause internal and mouth injury to grazing stock (Tasmanian Government Invasive Species). The bulk of the evidence indicates potential toxic and physical injury risks to humans and livestock and potential for reductions in carrying capacity. Shrub that grows between 1 to 1.5 metres tall and 1 metre wide. Likely that the weed would have a low nuisance value. In WA it has been found on walking trails. ‘.. infestations of false yellowhead would detract from the aesthetic and natural values of bushland and could reduce its tourism appeal’. Likely that some recreational uses affected (Victorian Invasive Plants). Dense infestations may also reduce the productivity of pastures and the aesthetic appeal of tourist areas (Weeds of Australia Biosecurity Queensland Edition). An exhaustive Google/Google Scholar search did not reveal any additional or compelling evidence to support substantial blockage or slowing of movement, and the question defaults to a “no” answer at this time. Reproduces by seed only (Victorian Invasive Plants). An exhaustive Google/Google Scholar search did not reveal any evidence to support this and the question defaults to a “no” answer at this time. Reproduces by seed only (Victorian Invasive Plants). An exhaustive Google/Google Scholar search did not reveal any evidence to support this and the question defaults to a “no” answer at this time. Moreover, this is a terrestrial plant that is unlikely to fragment naturally. Reproduces by seed only (Victorian Invasive Plants). By estimation a medium sized plant may produce an average of 600-700 flowers per year each giving rise to about 50 viable seeds (Victorian Invasive Plants). The bright yellow 'petals' (i.e. ray florets) are 10-12 mm long and at the centre of the flower-head are numerous (about 36) tiny yellow flowers (i.e. tubular or disc florets). Several hundred of these flower-heads can be produced in branched clusters towards the tips of the stems (i.e. in terminal panicles) (Weeds of Australia Biosecurity Queensland Edition). Germination generally takes place following rainfall and can be quite prolific when fire or mechanical disturbance create bare ground. Opportunistic germinator (Victorian Invasive Plants). D. viscosa germination occurs mostly after autumn rains but may occur at any time adequate moisture is available. Germination appears to be favoured by ground disturbance and fire. Deep dormancy has been demonstrated in the laboratory but the longevity and viability of seeds is not known (Tasmanian Government Invasive Species). In its native range, D. viscosa germinates mostly after autumn rainfalls but if adequate moisture is available it may occur at any time. Removal of the seed appendices enhances germination. Being a ruderal plant species, D. viscosa is expected to germinate easily and to have little requirements for growth. We sowed seeds of D. viscosa in a greenhouse in spring (19/04/2012) in a mixture of 1/3 perlite and 2/3 loamy soil, at an average temperature of 25 ± 2 °C and RH of 70 ± 10%. The seeds germinated after 8-10 days, but their growth was slow; four weeks after sowing the plants attained 15-20 cm height (Biology of Dittrichia viscosa, a Mediterranean ruderal plant: a review). Assumed this is a Yes with medium confidence. Parolin, P.., M. Scotta I., Bresch C.., & others (2014). Biology of Dittrichia viscosa, a Mediterranean ruderal plant: a review. PHYTON-INTERNATIONAL JOURNAL OF EXPERIMENTAL BOTANY. 83, 251–262. In California acts as an annual (Calflora). Blooms Sept - Nov in California (only recorded in one county in California: Solano) (Calflora). Dave's Garden user notes that in Spain (zone 8b), flowers all summer and fall (Dave's Garden). Flowering occurs during summer and autumn (i.e. from December to May) (Weeds of Australia Biosecurity Queensland Edition). Its prolonged flowering lasts for a long period, towards the end of the warm season, from August to October. Its fruits are mature in October and November and they are wind dispersed (Biology of Dittrichia viscosa, a Mediterranean ruderal plant: a review). In California, bloom period is only three months, and this is a "no". Seeds spread by air and water primarily. An exhaustive Google/Google Scholar search did not reveal any additional evidence to support this kind of dispersal, and no morphological adaptations exist for attachment, and the question defaults to a “no” answer at this time. Seed said to be spread by flotation (air or water) and also during soil movement (e.g. in road making or road grading, which also might have been the case in the California establishment) or when attached to machinery (Jepson). Spread by wind, water, attached to machinery. Very light wind dispersed seeds. ‘Seed dispersal is aided by the ‘pappus’ .. which catches the wind and can assist flotation’. Very likely that some propagules will disperse greater than 1 km (Victorian Invasive Plants). The light brown 'seeds' (i.e. achenes) are approximately 2 mm long and topped with a ring (i.e. pappus) of about 15-25 whitish bristles (about 5 mm long). False yellowhead (Dittrichia viscosa) reproduces by seed, which are commonly dispersed by wind and water (Weeds of Australia Biosecurity Queensland Edition). Its fruits are mature in October and November and they are wind dispersed. Dispersal occurs when the pappus catches the wind or allows the plant to float in running water (Biology of Dittrichia viscosa, a Mediterranean ruderal plant: a review). Seed said to be spread by flotation (air or water) and also during soil movement (e.g. in road making or road grading, which also might have been the case in the California establishment) or when attached to machinery (Jepson). Spread by wind, water, attached to machinery. Very light wind dispersed seeds. ‘Seed dispersal is aided by the ‘pappus’ .. which catches the wind and can assist flotation’. Very likely that some propagules will disperse greater than 1 km (Victorian Invasive Plants). They can also be spread during soil movement (e.g. during road construction and maintenance) or by vehicles and machinery (Weeds of Australia Biosecurity Queensland Edition). An exhaustive Google/Google Scholar search did not reveal any additional, compelling evidence to support this as a frequent method of dispersal, however, and the question defaults to a “no” answer at this time. Primary mechanisms for long-distance dispersal seem to be wind and water.